A North American beaver (Castor canadensis) swimming through water lillies along the cove at Juanita Bay. A very curious North American River Otter (Lontra canadensis) in an eye to eye moment with me. A North American beaver (Castor canadensis) checking out its surroundings while swimming through water lillies. 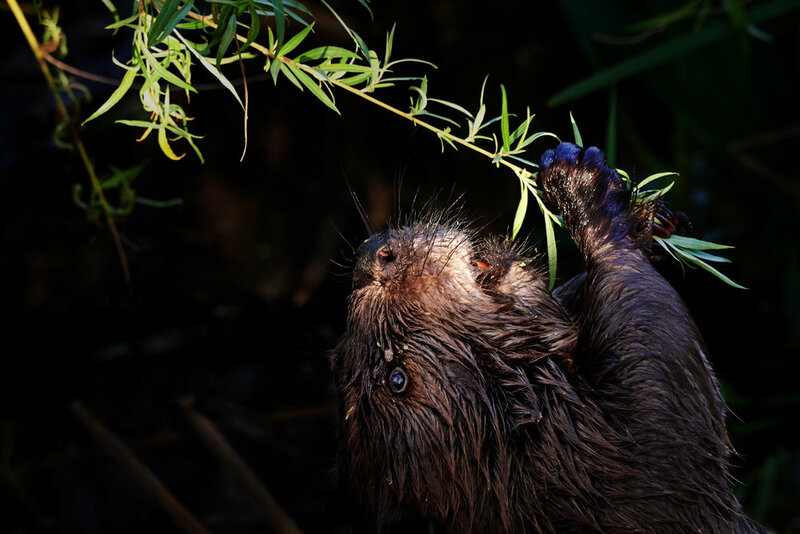 A North American beaver (Castor canadensis) reaching out to grab fresh juicy greens that the spring season has to offer. 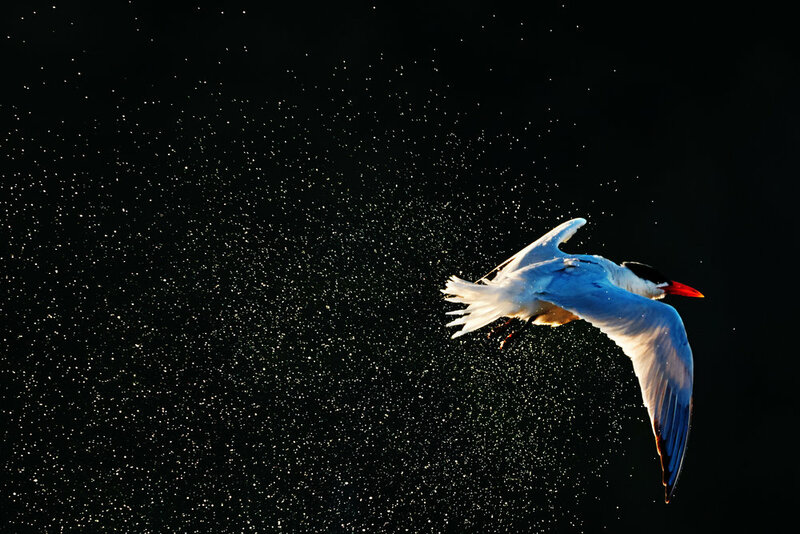 A Caspian Tern (Hydroprogne caspia) performing a water shake off after a dive. A Caspian Tern (Hydroprogne caspia) in splendid light. Caspian Tern (Hydroprogne caspia) flying over Lake Washington looking for Dinner. A colorful lilly pad from the bay. Water lilly pads forming a carpet over the lake, as seen from the sky. An American bullfrog (Rana catesbeiana), an invasive species native to Eastern United States, floating near the north boardwalk. A Great Blue Heron (Ardea herodias) in an elegantly posed moment. A North American River Otter (Lontra canadensis) about to take a dip in the water. A family of Mallard Duck (Anas platyrhynchos) mama and chicks. A Pied-billed Grebe (Podilymbus podiceps), swimming in the water, protected by water lillies. A Great Blue Heron (Ardea herodias) after a successful hunt. A Red-eared Slider (Trachemys scripta elegans), an invasive species, resting on a log surrounded by young lilly pads. A Bald eagle (Haliaeetus leucocephalus) flying off with a an unlucky victim. A Bald eagle (Haliaeetus leucocephalus) basking in the evening sun, as the baby leaves on tree shows the first signs of spring. A Bald eagle (Haliaeetus leucocephalus) flying in with a freshly caught carp. A pair of Wood Ducks (Aix sponsa) hanging out with a pair of Red-eared Slider turtles (Trachemys scripta elegans). 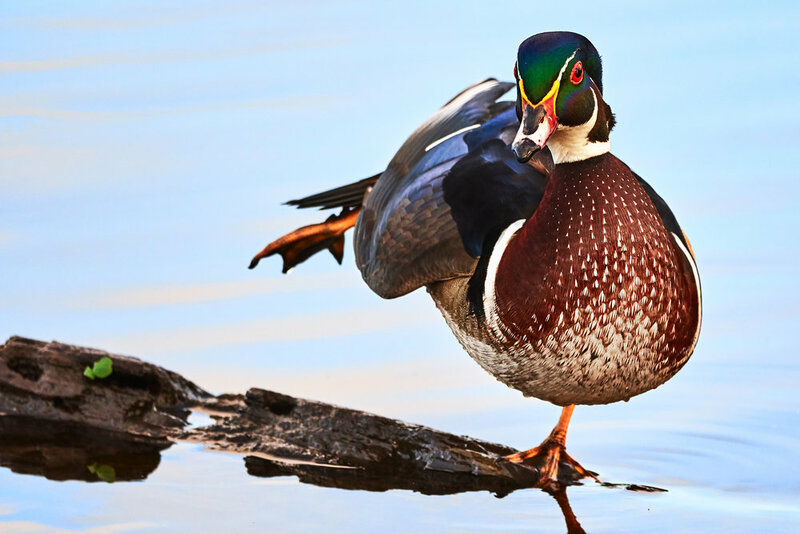 A male Wood Duck (Aix sponsa) stretching out in the evening light. 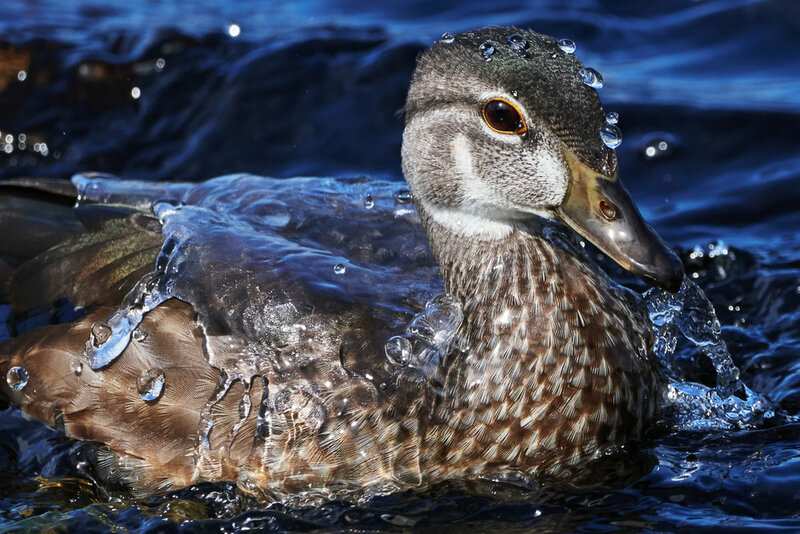 A female Wood Duck (Aix sponsa) during her daily cleaning routine, splashing water all over her plumage. A male Wood Duck (Aix sponsa) swimming in its own reflection, showing off its vibrant plumage. A male Anna's Hummingbird (Calypte anna) in full on display mode to attract a mate. An Anna's Hummingbird (Calypte anna) in flight, moving from flower to flower in search of nectar. A female Anna's Hummingbird (Calypte anna) in her nest made up of lichen, hair, fur and spider webs. A White Crowned Sparrow (Zonotrichia leucophrys) singing away in the morning light. 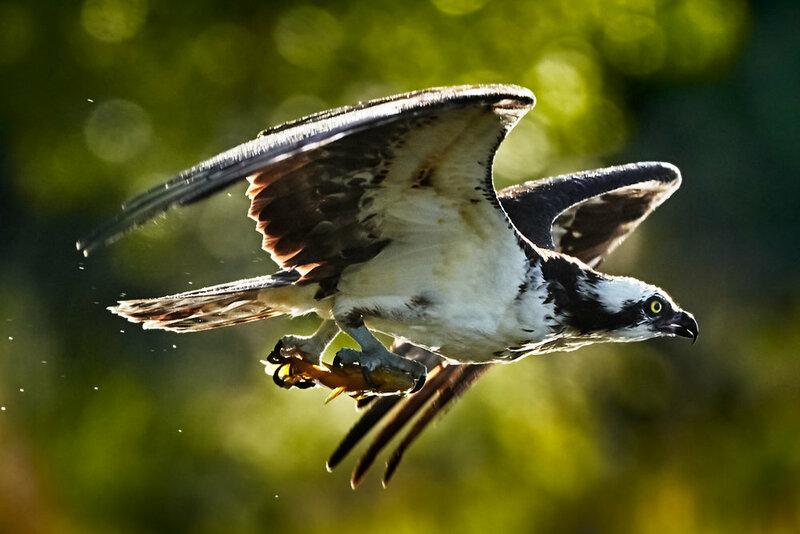 An Osprey (Pandion haliaetus) flying on to a branch with a fresh catch, illuminated by some great backlight from the evening sun. A male Red-winged Blackbird (Agelaius phoeniceus) taking off into flight from duck weed stems. A Wilson’s Snipe (Gallinago delicata)goes for a rare walk around the thickets. A Great Blue Heron (Ardea herodias) hunting alongside the grassy banks of the bay. A Killdeer plover (Charadrius vociferus) walking on the muddy shoreline in search of worms to devour. Mallard ducklings (Anas platyrhynchos) playing with each other while taking a bath. A North American beaver (Castor canadensis)heading back from his evening rounds. Juanita Bay in late fall. A pristine looking Trumpeter swan (Cygnus buccinator) taking an evening shower at Lake Washington. A bevy of Trumpeter Swans (Cygnus buccinator), basking in the glorious sunshine. Portrait of a male Red-winged Blackbird (Agelaius phoeniceus). A flock of wintering ducks flying in over the ridge-line of the west shoreline. A Red-tailed Hawk (Buteo jamaicensis) with its nictitating mebrane sliding over the eye. A line of American Coots (Fulica americana) resting on a floating log. 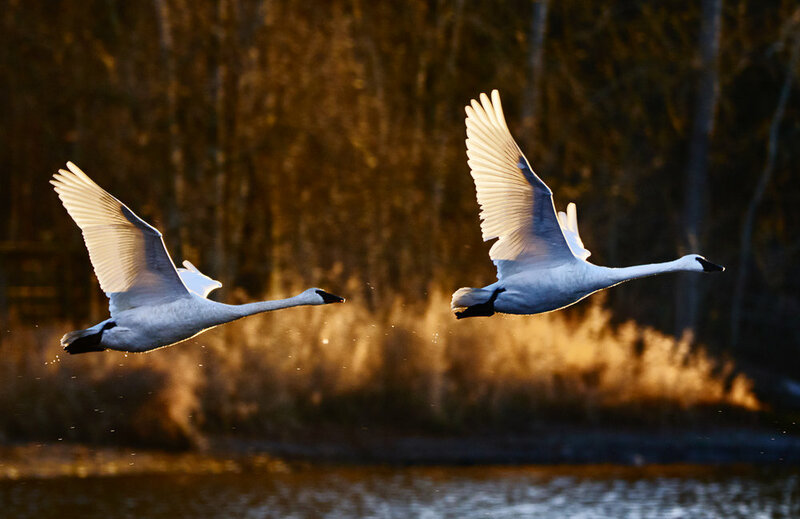 A pair of Trumpeter Swans(Cygnus buccinator) taking off into the breeze. Winter light illuminating the south boardwalk at Juanita bay as waterfowl swim in the foreground. A pair of The North American River Otters (Lontra canadensis) resting on a log on an early winter morning. A Pied-billed Grebe (Podilymbus podiceps), bathing in the warm evening light and cool colors of the lake. Portrait of a Mallard Duck (Anas platyrhynchos) . A male Bufflehead (Bucephala albeola) showing off its iridescent feathers. 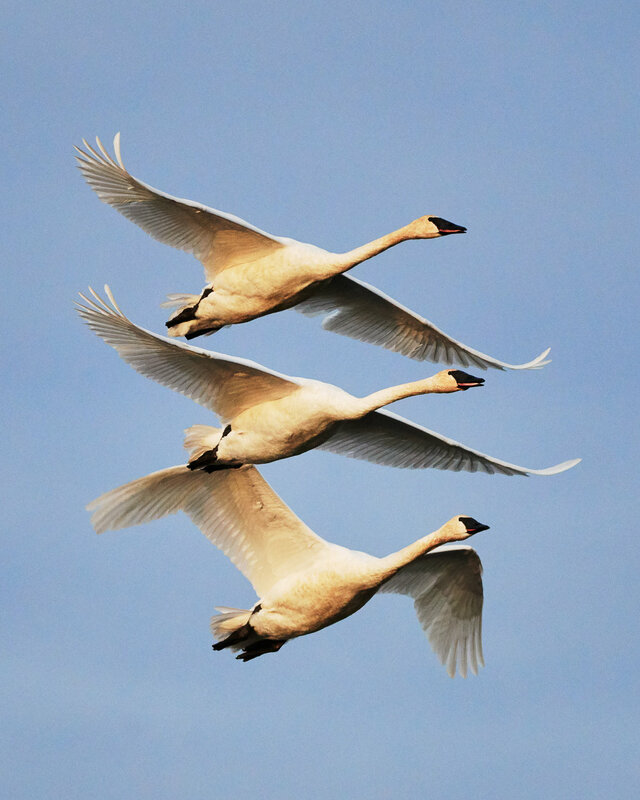 Trumpeter swans (Cygnus buccinator) in flight formation. A pair of Pied-billed Grebes (Podilymbus podiceps), running across the water. Trumpeter swans (Cygnus buccinator) flying in as excited onlookers watch on. Red-winged Blackbirds (Agelaius phoeniceus) flying back to their roosts at Juanita Bay. A young Sora (Porzana carolina) making a rare appearance out of the weeds.